In an almost unbelievable statistic, the Dayton Metropolitan area ranks worst in Ohio and 9th in the country in food hardship. Nearly every urban area in the Miami Valley is a food desert - the Dayton core is no exception. To assist in combating this problem, HSI has partnered with local non-profit organizations East End Community Services and Mission of Mary Cooperative to initiate change within the urban regions of East Dayton. 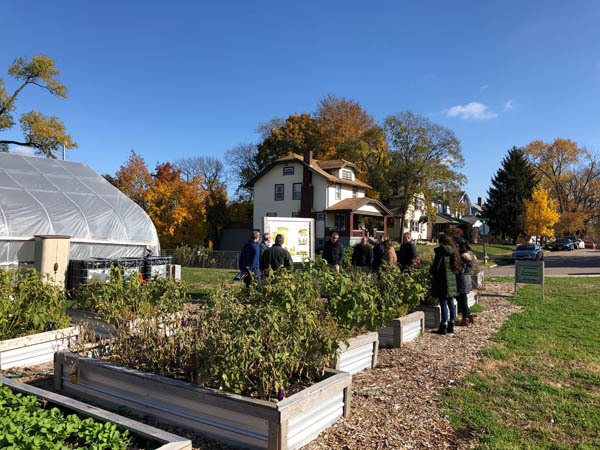 The initial goal of this partnership is to develop a sustainable, multipurpose urban agriculture and community green space within Dayton’s Twin Towers Neighborhood. The partnership is joined by MKSK, a Columbus-based landscape architecture and urban design firm in the work of bringing the vision of Lincoln Hill Gardens to fruition. 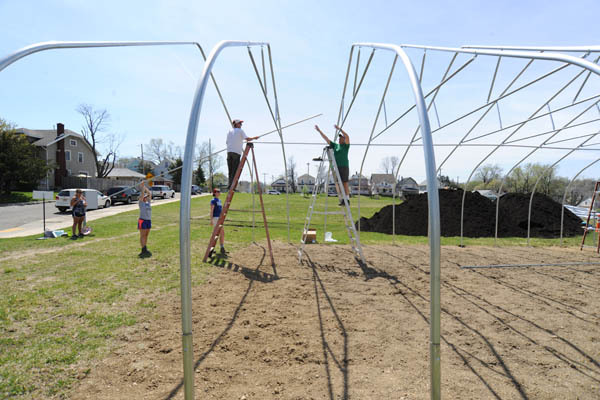 Mission of Mary Cooperative began farming on the Lincoln Hill site in the spring of 2016, utilizing the newly installed hoop house and high tunnels. 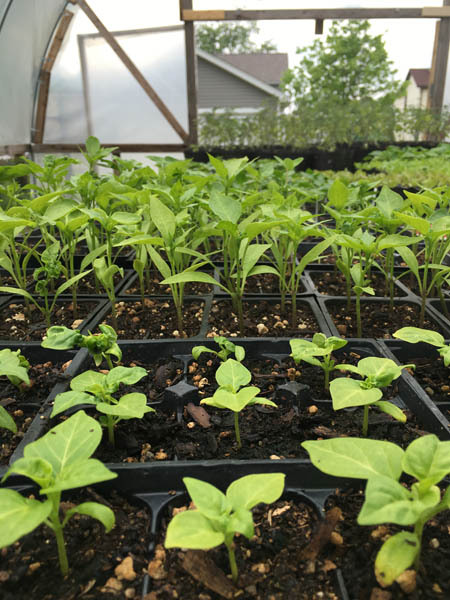 After a ramping up production over the first 6 months at the site, the full 2017 growing year at Lincoln Hill Garden was an even greater success, with early-spring, summer, fall, and prep for winter crops. In particular Mission of Mary focused on a significant tomato and pepper crop and fall carrots and greens. The change in season is marked by the "roll" of the high tunnels. 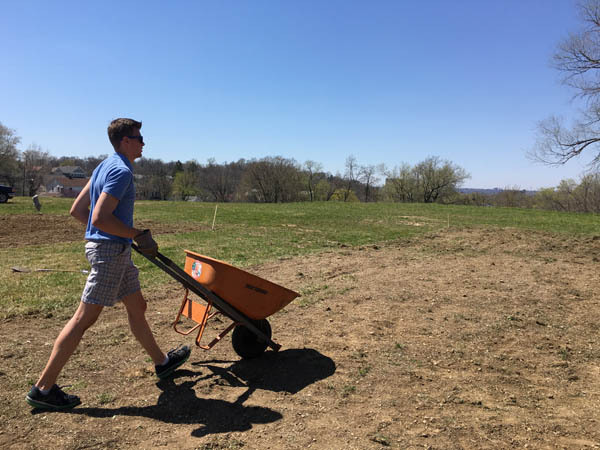 In the spring of 2017, a group of Mission of Mary staff and volunteers, East End Community Services staff and volunteers, community members and UD faculty, staff and students worked over multiple days to install the first phase of the community garden beds at Lincoln Hill Gardens. These first 20 beds were used during the 2017 growing season by Twin Towers residents and Mission of Mary. Thanks to a generous donation of from Vectren, work began on phase 1 of the the fruit and nut orchard in late Fall of 2017. With the installation help of UD facilities management and the University of Dayton Sustainability Club, Lincoln Hill Gardens now has an orchard composed of sour cherry, sweet cherry, fig, plum and pawpaw trees—pawpaw being one of Ohio's native fruit trees, that tastes like a medley of banana, mango and citrus. The orchard's phase two will happen in the Spring, adding dwarf apple and pear trees to the mix. This orchard will provide educational workshop opportunities as well as fresh fruit to the City of Dayton. Thanks to Vectren and all the community partners who made this possible. In addition to assisting with site preparation for the orchard, UD facilities management assisted with the preparation of phase one of the nature playscape, including site modification and donation of wood chips, tree stumps, and limbs. This work will help bring to life the design of student leader, Abby Lisjack. Abby worked on planning and design of the playscape with community partners and nature playscape experts, Eric Sauer and Doug Horvath of Five Rivers Metroparks, over the summer of 2017. Doug, in particular, leads the Miami Valley's No Child Left Inside program. A project involving the University of Dayton Hanley Sustainability Institute is turning heads and stopping traffic. But today, citizens are reclaiming their neighborhood. 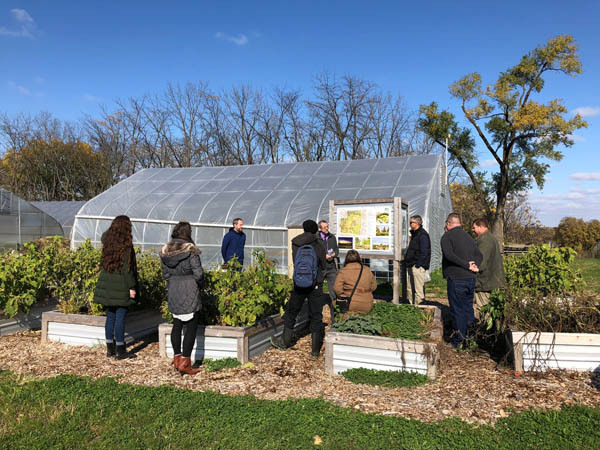 And a partnership among the University of Dayton, East End Community Services and Mission of Mary Cooperative is working to transform the former Lincoln Elementary School site into an urban farm and greenspace. many of the Institute’s initial successes stem from University partnerships, as well as faculty- and student-led research projects. For example, Lincoln Hill Gardens grew from course work in the sustainability, energy and the environment minor, and existing relationships with East End Community Services and Mission of Mary Cooperative. 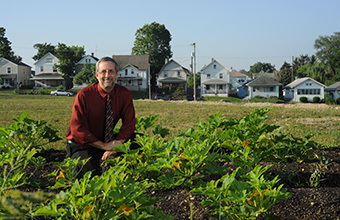 The University of Dayton Hanley Sustainability Institute and partners East End Community Services, Mission of Mary Cooperative and the Twin Towers neighborhood are taking the first step in transforming a former Dayton Public School site into an urban farm and green space. Check out the progress at Lincoln Hill Gardens.